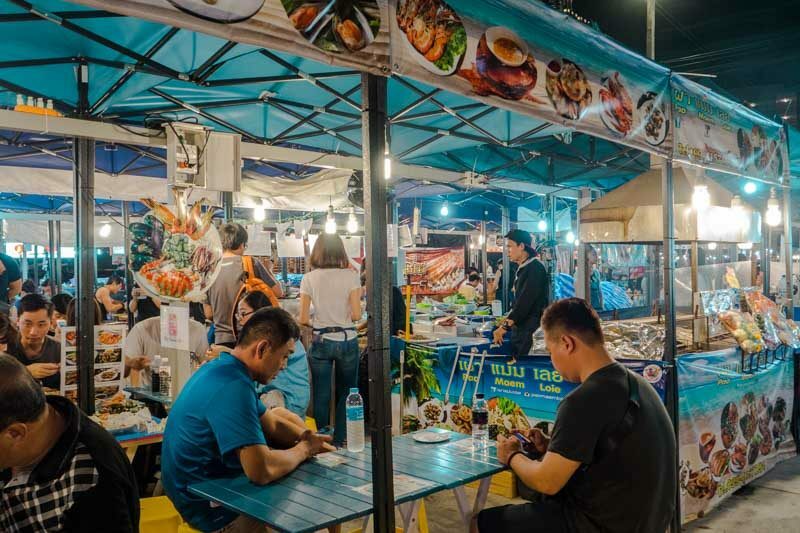 If there’s one thing that I look forward to on every trip to Bangkok, it would be to visit their night markets and stuff my face silly with its amazing array of street foods. 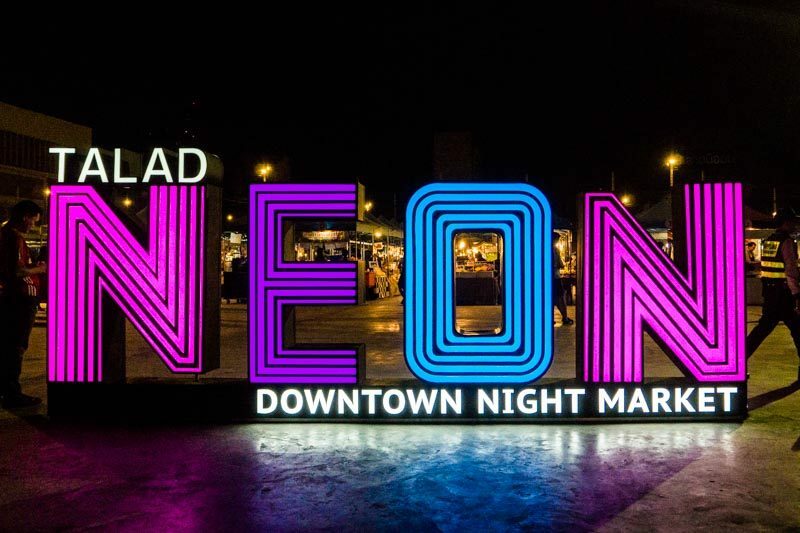 Talad Neon is the latest hipster downtown night market to open in the heart of Bangkok by The Platinum Group. Curious about the hype it’s getting on social media platforms, I got down to exploring it personally — mostly to sniff out interesting foods. 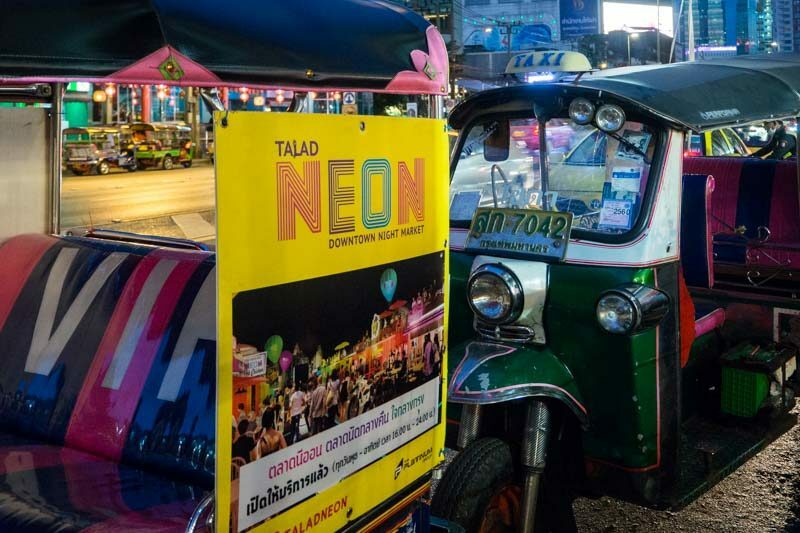 First thing first: How to get to Talad Neon? 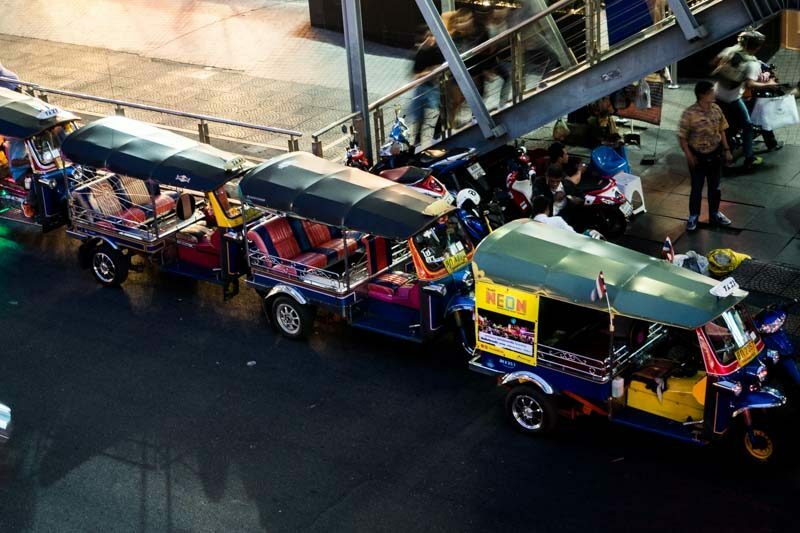 Hop on to one of these Tuk Tuks parked along the bustling road in front of Platinum Fashion Mall, they bear the prominent “Talad Neon” signs, visible even at a distance. The ride will cost about THB 120 (approximately S$4.82), a tad costly for a short distance. 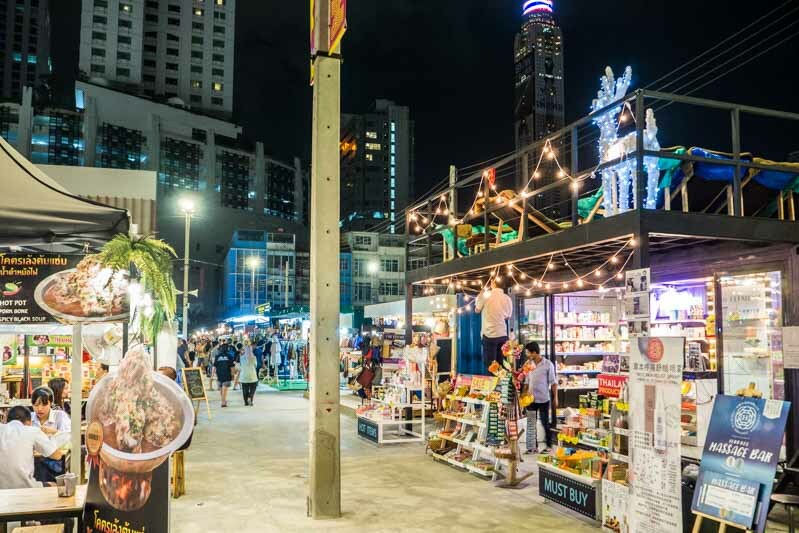 If you’re intending to save on those Thai Bahts, you could get there on foot, which is about 10 minutes walk away — head towards The Berkeley Hotel Pratunam and you’re on the right track. 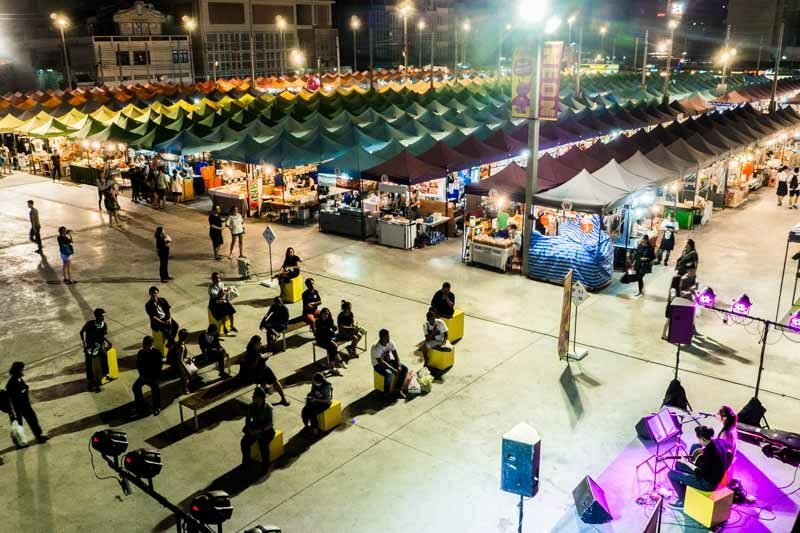 Greeted by bright lights and a live band to serenade the crowd, the only thing “neon” about the entire market that I noticed was probably the large sign seen at the beginning of this article. The multicoloured tents are arranged in an orderly fashion, which are easy to meander through row by row. That way you won’t get lost and repeat walking pass the same stalls again. 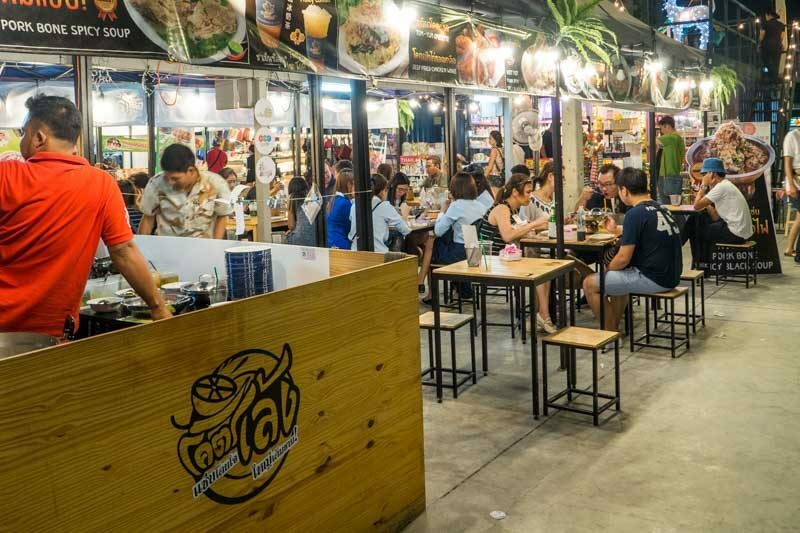 I headed straight to the food section, which covered about half the size of the market — so, if you’re planning on visiting, here are some stalls you may want to check out! 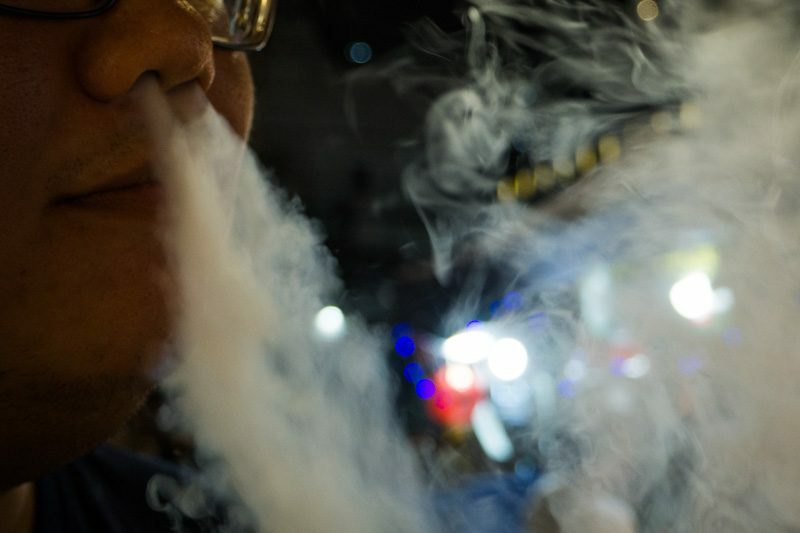 Similar to the dragon’s breath candy found in Singapore, these smoke effects are created by pouring liquid nitrogen over puff rolls to make them extremely cold. 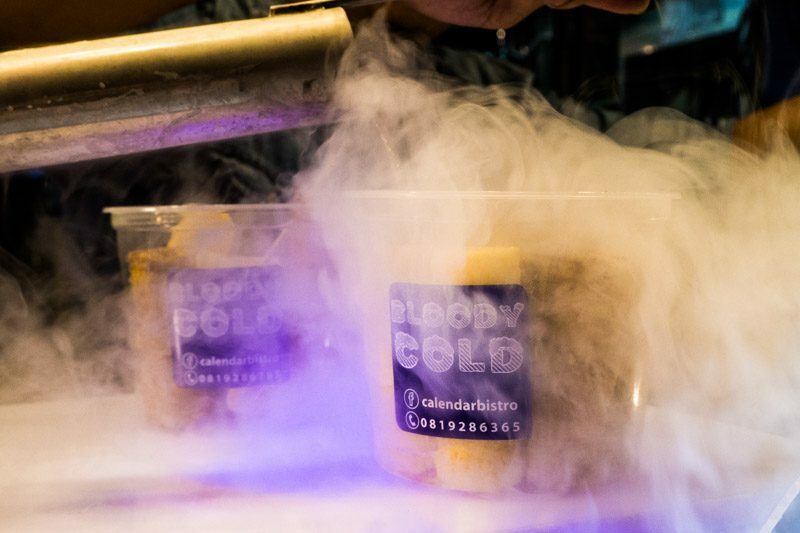 It comes in flavours of Vanilla Ice, Chocolate Rock, or you can have a mix of both flavours, all of which cost THB 79 (approximately S$3.18) for a cup of seven rolls. Although the rolls weren’t spectacular in taste, we had fun breathing smoke out of our nostrils for that few short minutes. Careful when holding the cup though, I accidentally held it at the base and cried out “BLOODY COLD” in pain. I guess, that’s how they got the inspiration for the shop’s name from burning their fingers too. 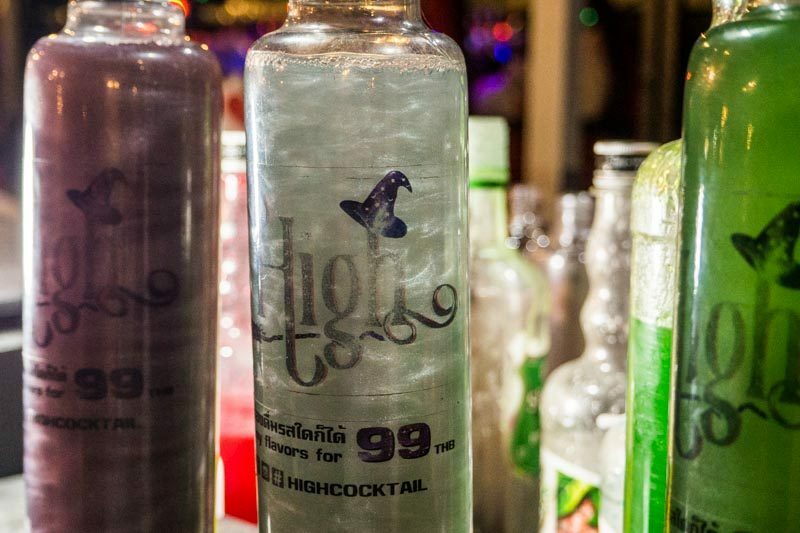 Resembling bottled magic potions of sorts, or a witch’s concoction served in a plastic bucket, High sells a variety of shimmery Mocktail (THB 100, approximately S$4), and Cocktail (THB 150, approximately S$6) for alcoholic versions. Shake it up for the shimmer swirls to form. We had the Last Ocean, mixed in with Sprite, which overpowered any other taste it was supposed to have. I’d be honest and say, it was bought for the fun of its intriguing aesthetic purposes. Tempted by the large standee outside the stall, the Pork Bone Spicy Black Soup (THB 200, approximately S$8) was what caused us to slow down our footsteps and quickly grab a seat. 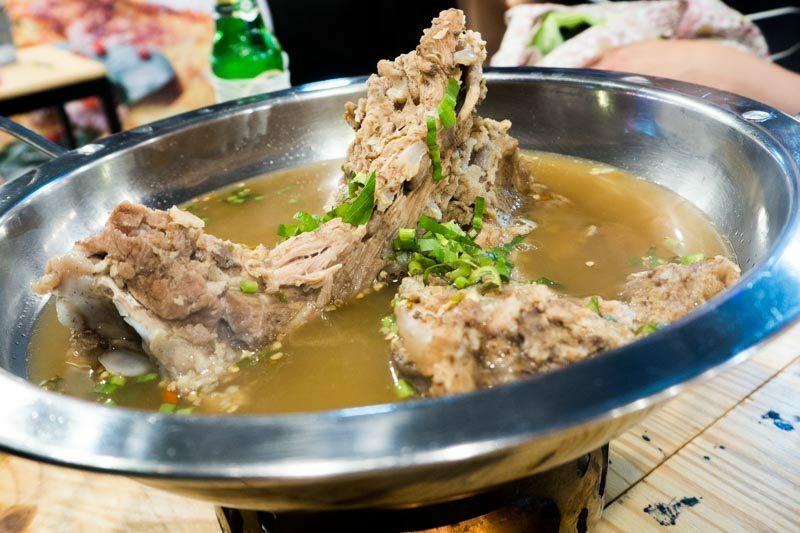 The hot pot came with two large pork bones, which reminded us of a super-sized version of Bak Kut Teh. Huge it was, and really value for money! The meat was tender and fell off the bones easily, you could pick up the bone and gnaw on it, no one’s going to judge. The spicy black broth had hints of lemongrass and lime, almost like having tom yam, but what made it different was the evidently strong natural sweetness from the long hours of boiling the pork bones. Slurp on it carefully or you’d be bound to get bouts of cough from the heat of the chilli hitting your throat. 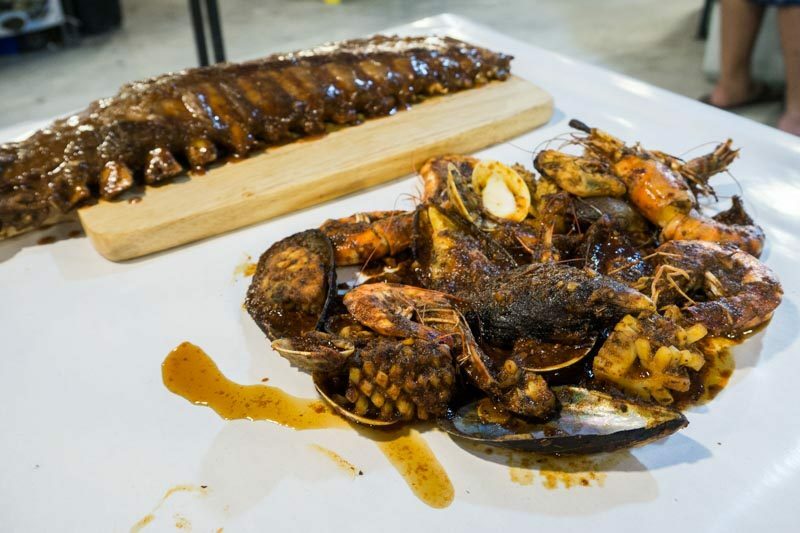 The shrimps aren’t the only thing crazy here; while you’re working your way through the platter of All Seafood (THB 399 / THB 599), grab a slab of baby back ribs (Medium – THB 190 / Large – THB 360, approximately S$7.60 / S$14.50) too. You can have the sauce in different levels of spiciness ranging from mild, medium spicy, to very spicy. Then, enjoy the yummy mess with your hands. All deck in blue, Pao Maem Loie is not hard to miss with huge seafood platters displayed on every table. The largest portion costs THB 750 (approximately S$30), which is more than enough to feed four to five hungry adults. 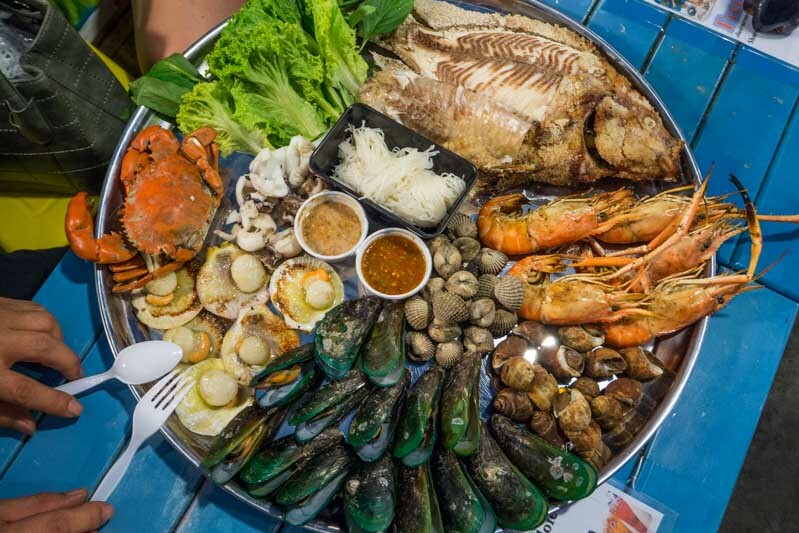 The set comes with grilled scallops, mussels, tiger prawns, a crab, squid, an entire fish, cockles and sea snails. As with every Thai meal, fresh vegetables and vinaigrette chilli sauce is served alongside the dish to enhance the taste. Need I mention how Instagram-worthy this platter is too? Now that you’re informed, keep your tummy empty to feast on this! 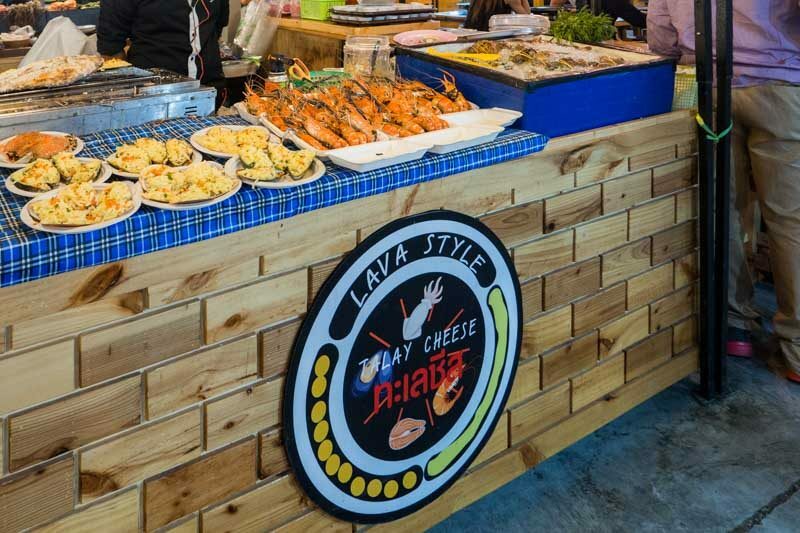 “Talay” translates to seafood, so at Lava Style, you’ll be getting cheese to accompany every seafood dish you order. 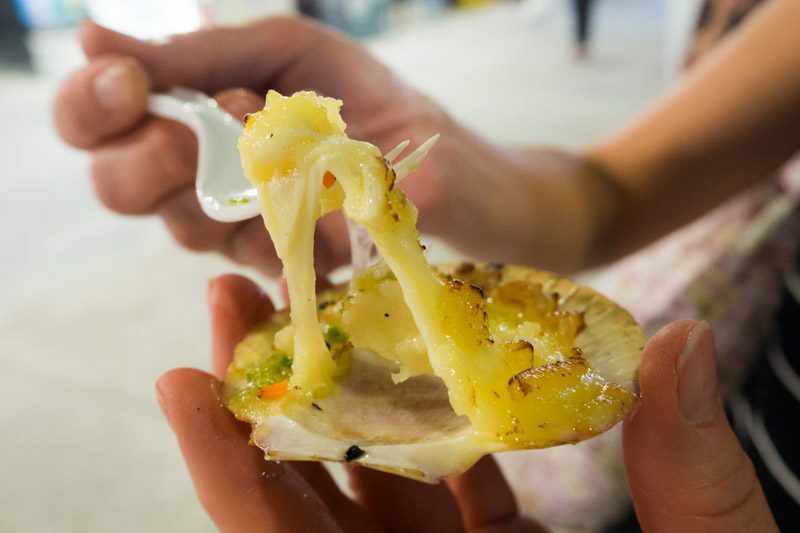 The cheese on scallops (THB 150 for 5, approximately S$6) were simply irresistible. 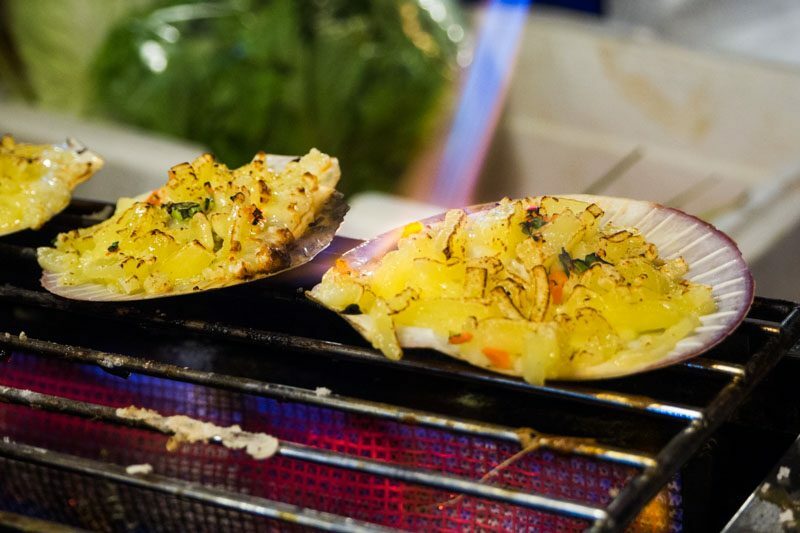 Placed on a grill, the cheese on top each scallops were then further melted with a torch for the slightly charred texture. Drizzle chilli over it, then pull it up and enjoy the juicy scallops that are enveloped within the gooey melted cheese. It would have been better if the scallops were left on the grill for a longer time. While the flesh was thoroughly cooked, it was slightly cold within. We figured, they could have been pre-cooked beforehand. 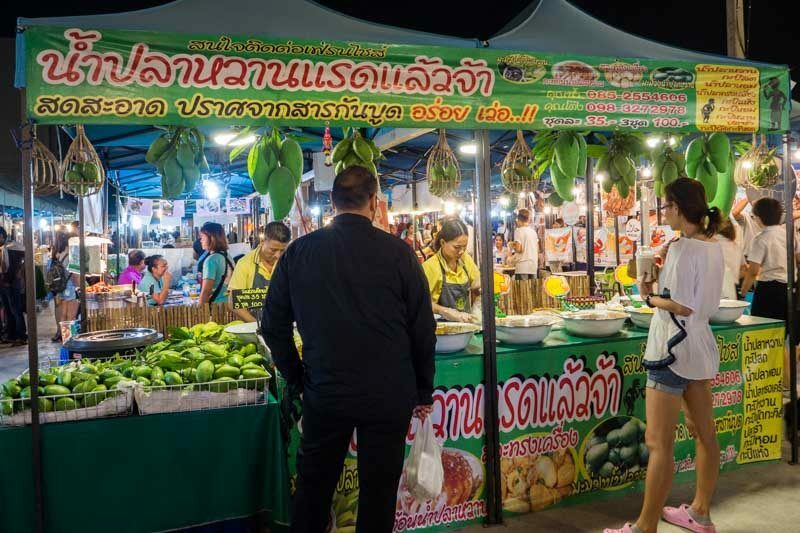 Mangoes play an essential part of Thai’s culinary — expect to find them prepared or cooked in different styles, and one of such is eating them raw before they’re ripe. While they are delicious and tangy on its own, the special dip sauces are crafted to turn them into savoury snacks to get you through the day or fill you up when you’re peckish. 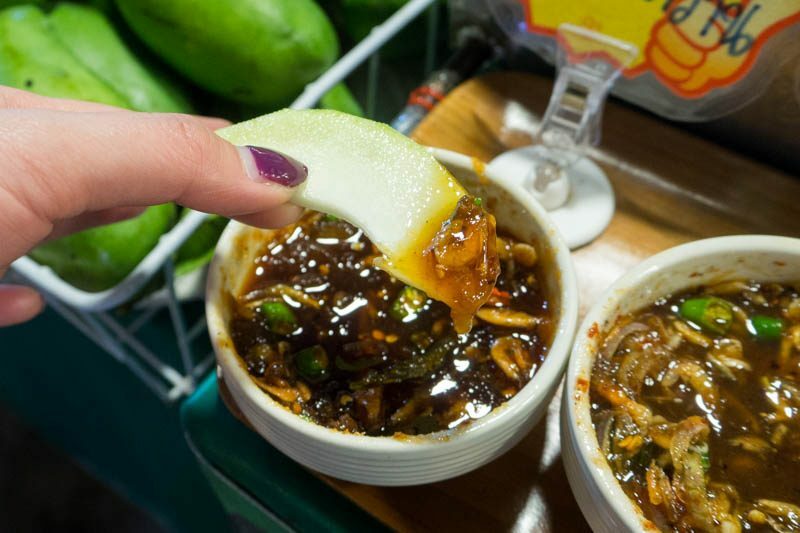 A set of mango & one packet of sauce is sold at THB 35 (approximately S$1.40). The one we choose had shrimps, chilli in a sweet sauce base, which tasted a little like Nasi Lemak chilli. 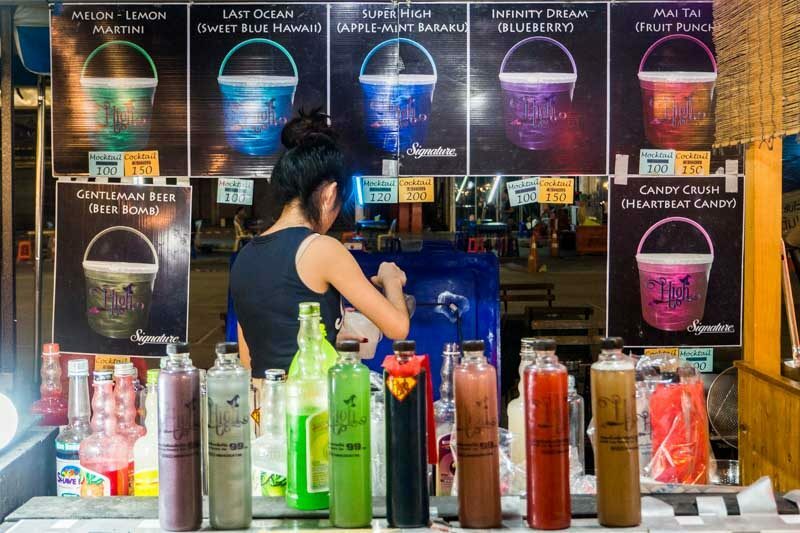 This came in handy to cleanse our palates in between snacking along the night market. 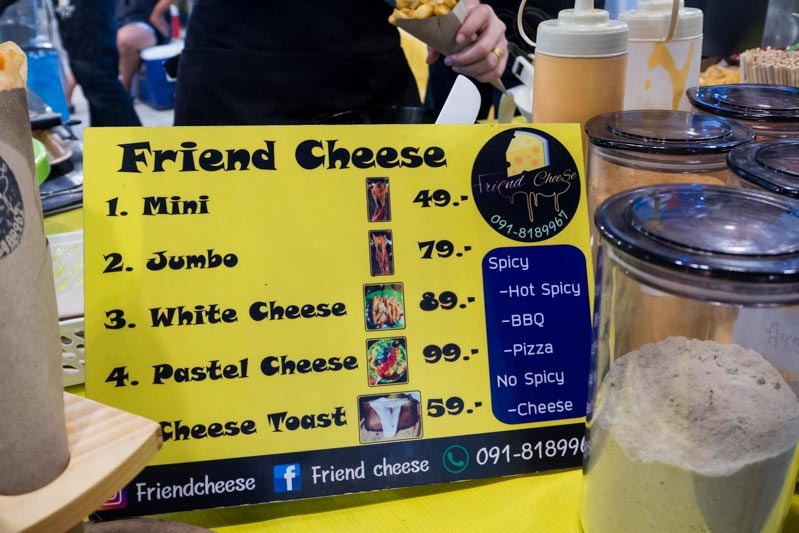 Friend Cheese will satisfy your cheesy cravings with the variations of cheese offerings on its menu. You could have it Spicy (Hot Spicy/ BBQ/ Pizza) or Non-Spicy in its original flavour. We were intrigued by the Pastel Cheese, sadly they weren’t selling it that day, so we ended up with a Mini with Pizza flavour (THB 49, approximately S$1.96). 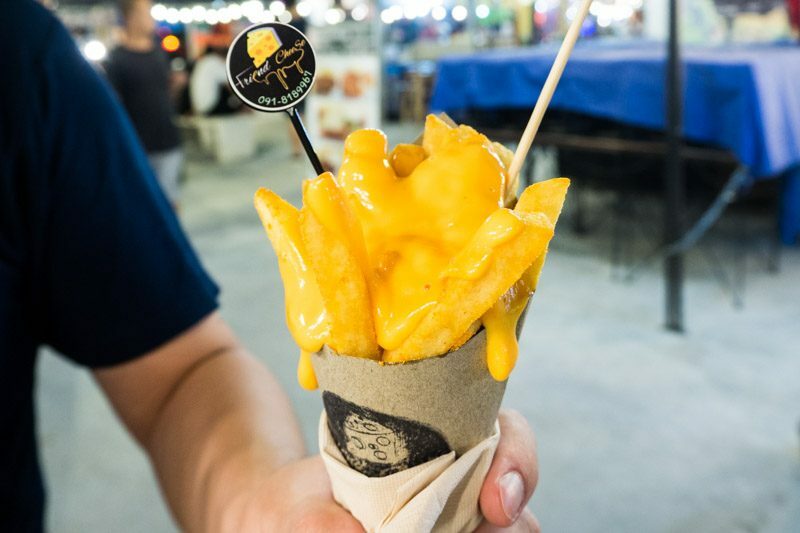 The cheese was running over the sides of the cone which is used to hold the fries in. It has a consistency of a viscous sauce that nicely coats every piece of fries. 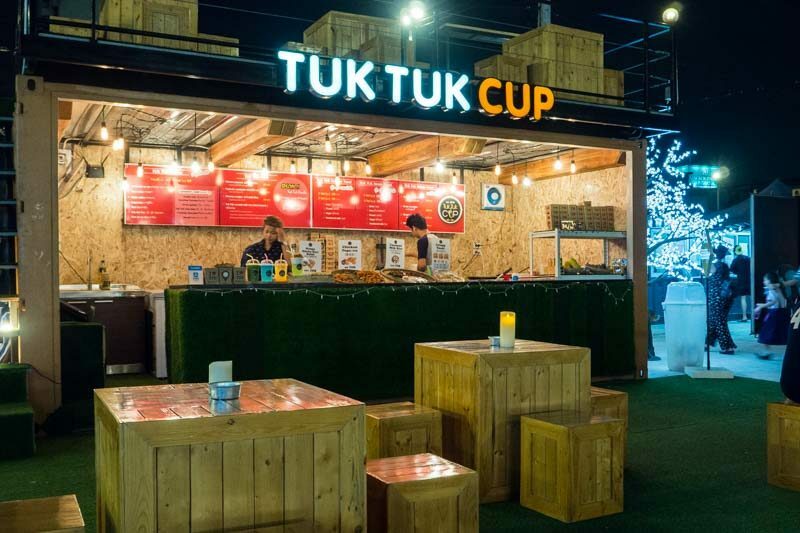 Along the rows of container shops and bars, the Tuk Tuk Cup houses interesting spin on local Thai dishes. 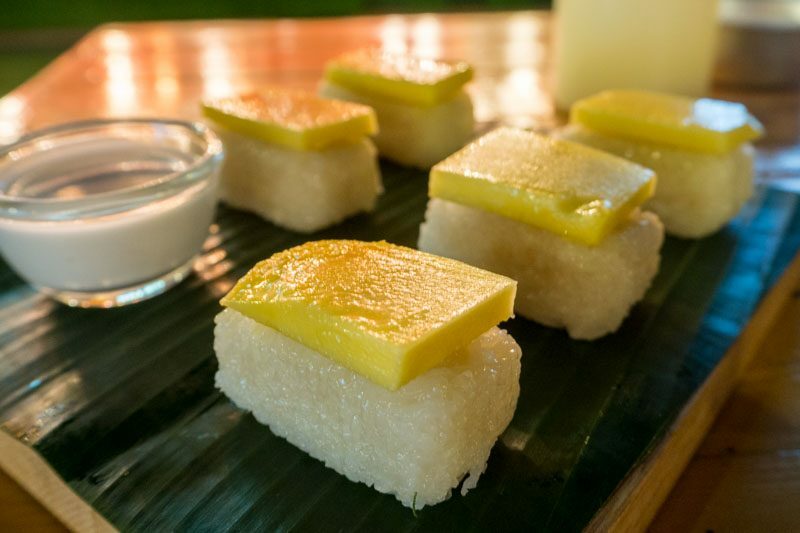 Reinventing the popular Thai dessert, the mango sticky rice is shaped into convenient bite-sized sushi, while the coconut milk is served in a saucer to dip your “sushi” in it. While it isn’t the best mango sticky rice I’ve had, props to the store for being creative at the way it’s served. 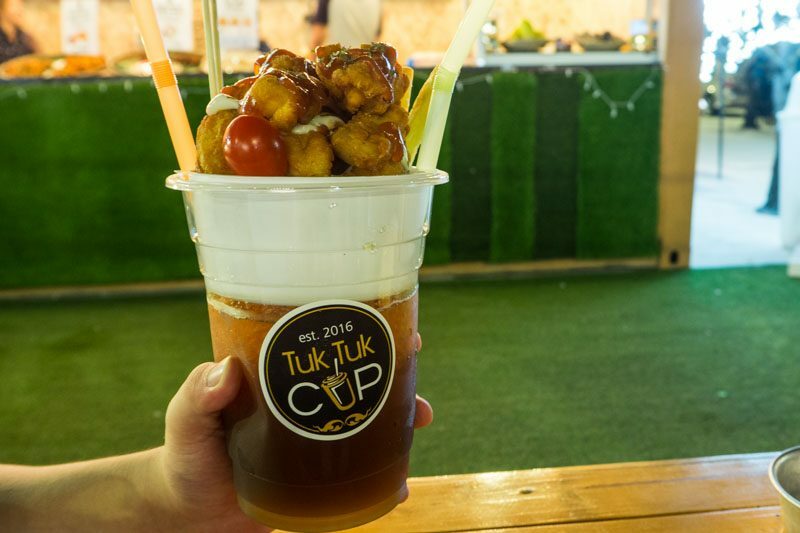 If you’re in need of a small bite and something cold that will quench your thirst from all the walking, the Special Tuk Tuk Combo lets you choose from any drink and side from its menu and combines them into one nifty huge cup. But of course, the drink is separated from the snack with a smaller cup placed over the top. 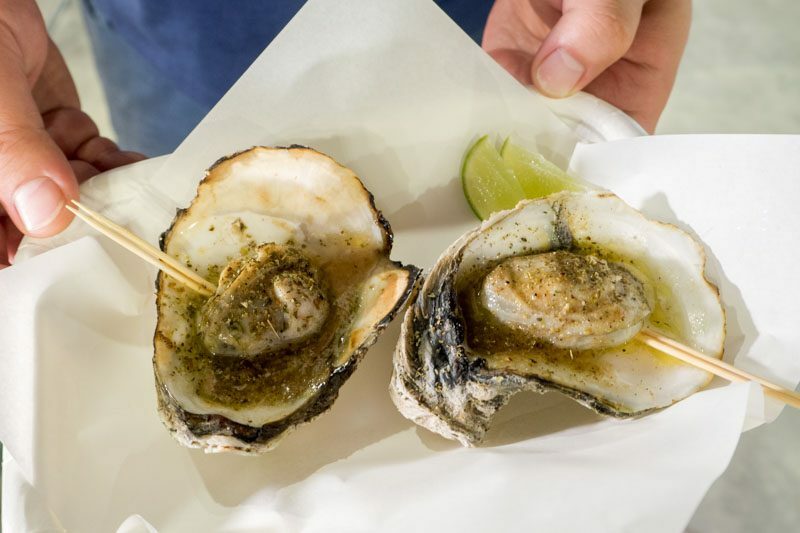 If you’re all about oysters, Oh My Clam specializes in grilling them in butter & garlic or cheese. I know there are places that sells oysters for S$1 back in Singapore, but don’t let its price deter you from spending on these babies. Shucked and prepared on the spot, they are then placed over the grill along with a scoop of garlic butter. 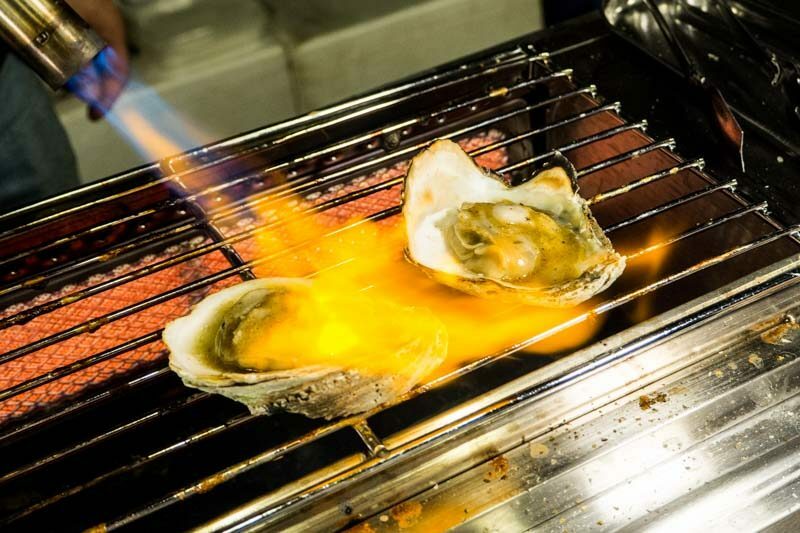 Then it is torched further for the oysters to be fully cooked. Juicy, garlicky with a burst of flavour, these went into our tummies within seconds. Squeeze the lime for an added citrus-y tang, or have it as it is for a robust flavour. 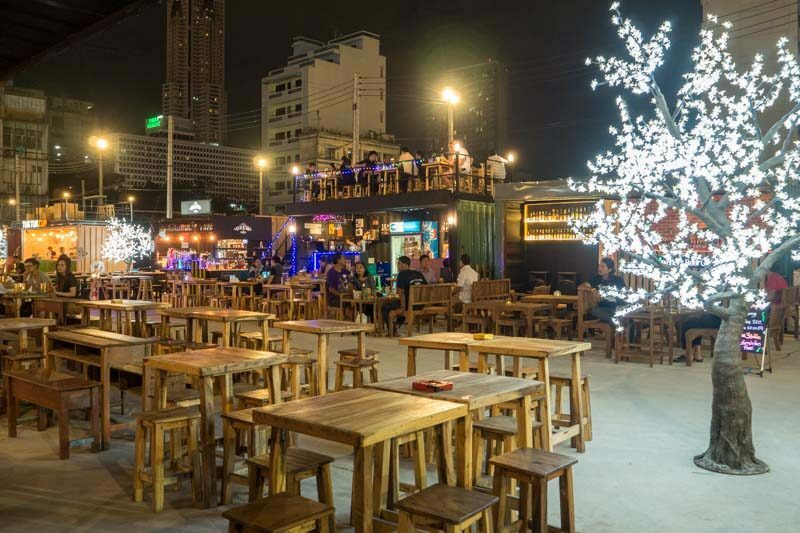 Just when we thought that we’ve come to the end of the food section, we walk into the bar section that looked a lot cooler with illuminated trees and container stalls. The alley is lined with rows of wooden tables and chairs to make yourself comfy while enjoying drinks and small bites. 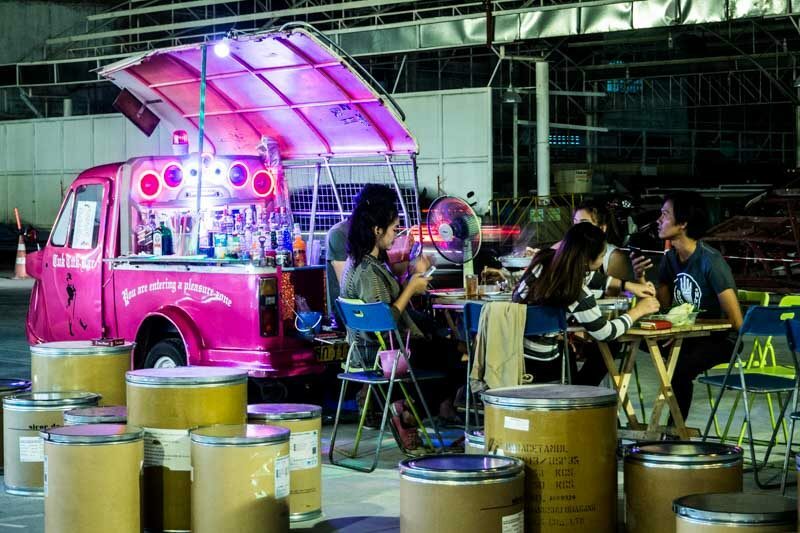 Otherwise, you could gather around the tables and grab a drink from the vans parked along the market. 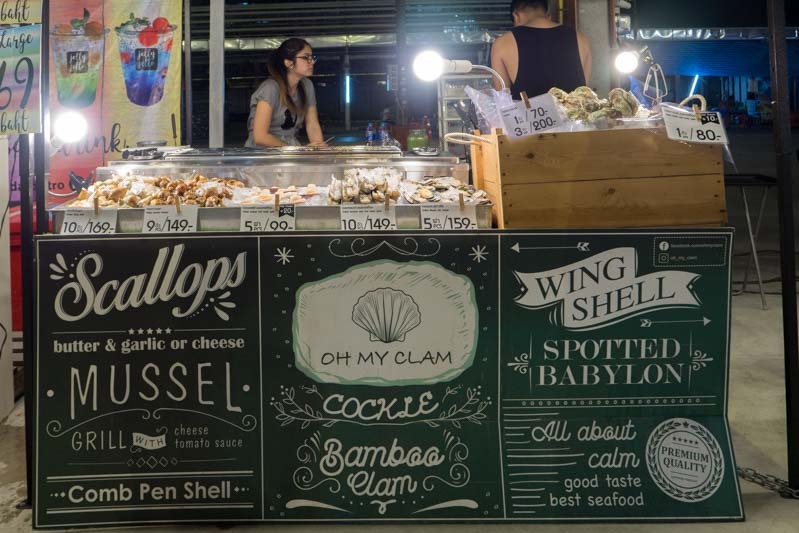 If there’s one thing that I noticed on my visit to Talad Neon is that most food stalls focus very much on its seafood selections. Hence, this guide is made up of mostly seafood dishes that you should get down on trying. Talad Neon isn’t as big as compared to Talad Rod Fai as I was expecting it to be, but I’ll definitely hop by again if I’m staying within the area. 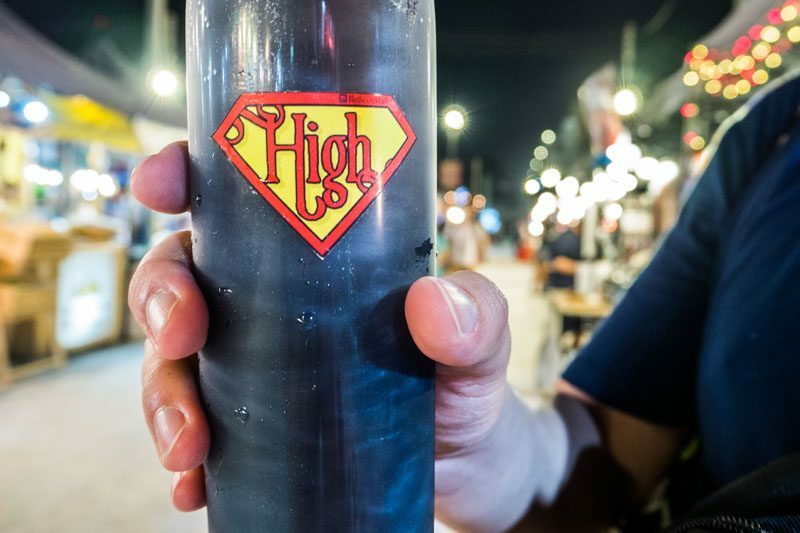 Also check out our Bangkok food guide!